The Long Island Express ended their 2006 Summer Tournament season with another title, this time in the rain shortened NJBL Labor Day Tournament. Remnants of Tropical Storm Ernesto came through on Friday night into Saturday, canceling all games for the 1st day, and creating a tournament structure that would allow for no playoffs. The winner would be decided by run differential. With this in mind, the Express were forced to employ a little different strategy, focusing on allowing no runs, while trying to score as many runs a possible. The formula worked, as the team allowed only one run in 4 games, and scored 40. Baseball teaches different things at different times, and this time the team learned that something’s are out of your control, such as the weather and tournament rules. We learned that the best thing you can do is take care of your own business, and let the chips fall where they may. The team was successful by concentrating on the game in front of them, and not looking ahead. Even though the tournament was shortened to 4 games, again each player brought his best game, and contributed either on offense or defense. Darien got the tournament going, ripping the 2nd pitch he saw up the middle for a base hit, and coming around to score on a triple by Dan H. Darien also added another hit in the game, and scored 6 runs in the tournament. Dan H. continued his hot hitting, ripping 3 triples, a double, and 3 singles. Dan’s speed on the bases lead to him scoring 8 runs, as well as playing a flawless outfield. Chris came through again with some big hits, including a big double against 3 Village in the 1st inning, as well as a huge bomb off the base of the fence to score 2 runs against a stubborn SYAG team when the score was only 1-0 at the time. Danny D. had a big 2 RBI double in the 1st game, and pitched lights out in the final game. Dan pitched a strong 4 innings, striking out 7 during the shutout. Matt was hot at the plate as well, ripping 4 singles and a triple. Matt scored 7 runs, getting on base 10 times. He also made a great defensive play at short, grabbing a ball headed for center, and making a great off balance throw to get the runner at 1st. Matt also pitched 6 strong innings of shut out ball. CJ continued his run of shut out pitching as well, extending his streak to 11 over the last 2 tournaments. CJ also had a huge hit in the 6th against SYAG to plate a run; a game the Express had a hard time scoring runs. CJ continued his strong defensive play behind the plate, as well as in the field. Dylan pitched 5 strong innings, also striking out 7. He too got a big hit in the 6th of the SYAG game to keep the inning alive, and made several nice plays at short. Kevin had a great weekend behind the plate, including picking a runner off 3rd. Kev had a big double in the last game against Huntington, as well as pitching 3 innings of shutout ball. Ryan started off slowly, but got it in gear on the 2nd day. He had a big 2 out 2 RBI double in the 6th of the SYAG game, and went 2-3 in the final. He also was involved in a bizarre play at the plate, striking out while Dylan stole home, only to have the catcher drop the ball, then proceeding to level Dylan as he started to run to 1st. Dylan was safe, as was Ryan, in a really wacky play. Nick had a good tournament in the field. While playing 3rd, he cut off a ball if front of the shortstop, and made a nice move to get the runner at 1st. Nick also ripped a couple of nice shots, some caught, but got one to drop in the last game. All in all, the team made the most out of the rain shortened tournament, and will be glad to receive the winner’s jackets when they come in. 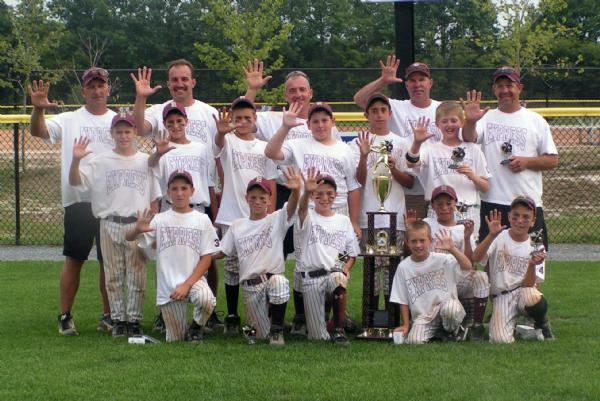 As baseball winds down for the year, it is important to remember how we got the 6 tournament wins. Teamwork, practice, and hard work. As the fall moves in, lets not forget to finish strong, work the hands, and keep up with the conditioning. Congratulations Boys, another job well done. You Boys Make Us Proud!! 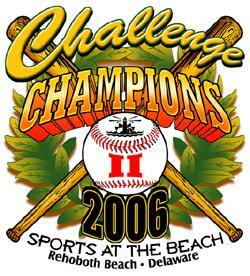 The 2006 Express Baseball train took its show out of state this past weekend, and rolled into Rehoboth Beach, Delaware,for the Challenge of Champions Tournament. The Mid-Atlantic Coast was well represented, with teams from Virginia, Maryland, Delaware, New Jersey, Pennsylvania, and New York. Twelve teams in all were hoping for the same thing, to walk away on Sunday with the title of Champion. It was only meant to be for one team, The Long Island Express, who lost their 1st game of the tournament, and then rolled off 6 straight victories for the tournament win. Their 5th straight tournament title during the 2006 season, an incredible accomplishment. The highlights were many, with all facets of the game stepping up at one time or another. Kevin pitched a 3-hit shutout, CJ pitched a 2-hit shutout, Chris pitched a 4-hit complete game giving up only 1 run, and Danny D, CJ, and Ryan combined on a 5-hit, 1 run outing as well. Dylan was outstanding, coming in on short notice to shut down a tough Delaware team, allowing only 3 hits and 2 runs over 6 innings to get the team into the semi-finals. The offense and defense were outstanding all weekend, with contributions from the whole lineup. - Chris batting .733, with 3 homeruns. A classic moment came in 3rd inning of the Scranton Storm game, with the score 2-0, Express. On a 3-0 count, Chris watched as the ball skipped off the dirt into the catchers mitt, dropped his bat, and headed to 1st for the walk. But wait, called strike made the count 3-1. Chris calmly picked up the bat, dug in, and launched a 3-run homer over the right center field fence. Classic concentration. - Danny D had a great weekend at the plate as well, batting .611, with a grand slam. Dan came to the plate in the 5th inning against the Castle Hill team, with the Express winning 4-1. Dan broke the game open with his shot to left center, and the team never looked back. Against the Young Guns, Danny had his best defensive inning to date in right field, diving to his left for the 1st out, tracking down a ball against the wall and throwing the runner out at 2nd for the 2nd out, and diving to his right for the final out. - Dan H was on fire with line drives all over the place. Danny had 9 hits in the tourney, and scored 10 of the teams 63 runs. Dan had a home run in the 1st game to bring the team within 1 run late in the game, and a monster 2 run blast in the championship game to put the game out of reach. Defensively, Danny showed off his arm when he threw out a disbelieving base runner at 1st from centerfield. The play really took the team off their game. - Kevin continued his hot tournament hitting, belting out 7 hits, none more important than the rip down the 3rd base line in the championship game with the bases loaded during the 8-run outburst that sealed the win. Kevin did a great job behind the plate, calling a great game, and keeping bounced pitches in front by getting in great position. - Dimitri joined the team for this tournament, and what an addition he turned out to be. Pounding out 9 hits, Dmitri turned the championship game tide in our favor with a 3-run homer in the 1st inning. This blast gave the team the confidence it needed to continue the hitting onslaught that would turn into a 17-9 victory. Dmitri’s heads up defense at 3rd was awesome, including throwing out a runner at 1st from his knees, and killing a Bluerock rally in the final game when he fielded a grounder, stepped on 3rd, and fired to 1st for the inning ending double play. - Matt continued to hit the ball hard, lining several balls into the outfield. A key double against a stubborn Castle Hill team helped knock in 2 runs, when the score was just 1-0. Matt continued his great defense, throwing a runner out from right at 1st, making a great catch of a line drive at short after holding the runner on at 2nd, and recording the last out of the tournament on a tough grounder up the middle, then changing direction and stepping on 2nd. - Darien got a little snake bit with some hard shots right at the defense. With the team up 4-1 against Castle Hill, 2 runners on, ripped a single threw the middle for an RBI, and the team went on to score 7 runs that inning for the mercy. Darien’s defense really sparked the team, with his willingness to take balls of his chest, keeping the ball in front, and making the plays at 1st. Darien took a real hard shot of his arm in the final, and had to come out of the game, but the pain felt a little less when you get to grab the trophy at the end of the game. - CJ kept the lineup moving this past weekend with a keen eye, grabbing 8 walks and a couple of hits. Scoring 6 runs, and pitching a total of 8 shut out innings, CJ was a huge contributor to the victory. Behind the plate, CJ was able to gun down 1 would be base stealer at 2nd, a great feat with the shortened bases. He also played a solid outfield when called upon. - Dylan had an outstanding tournament with the glove and on the mound, and stroked a key 2 RBI double in the attempted comeback against the Tidewater Bombers. While on the mound, Dylan initiated a bang-bang double play, fielding a hot smash, spinning and leading Matt across the bag, then over to 1st. No thinking, just reacting. Dylan also laid down 2 great suicide squeeze bunts at crucial points in the game. - Ryan got the ball rolling in the 1st game, scoring the tournaments 1st run, then coming on in relief to pitch 4 innings of 3 hit ball. He also had a crucial bunt single that plated the tying run against the Delaware Warriors in the 3rd inning, a game the team would go on win 8-5. Ryan made an outstanding catch in the championship game, racing in and diving for a ball just out of the reach of the shortstop, and ripped a nice line drive 1 hopper of the fence in center in his final at-bat. - Nick also showed a keen eye, grabbing 7 free passes, and scoring 5 runs. Nick continued to show his versatility, playing 2nd, 3rd, and in the outfield. A solid showing on defense helped seal the wins. All in all, the weekend was a whirlwind. Getting to stand on the 3rd baseline with the team, listening to the national anthem Sunday morning, and watching as the geese flew in formation over centerfield and past the flag was the stuff that goose bumps are made of. Back at the hotel, there was a little hallway hi-jinks, bed bouncing, and parking lot Frisbee football. The families really enjoyed the time together, a great bonding experience. A million thoughts by the coaches, who’s pitching, who’s sitting, who’s batting where, etc, ended as all the tournaments this year have; with a trophy. The weather was hot and sticky, but all the conditioning, all the water and fruit, all the parenting, “please stay cool”, paid off. When the gloves go in the air at the end of the day, it all is worth it. This has been a season of sacrifice, dedication, and fun. To strive to be the best; to never be satisfied; to learn from the mistakes. This team has surpassed all expectations, yet, still feels there is work to be done. A tribute to the fine up bringing of their parents, and a feeling of team. The frog would be proud, and so are we. 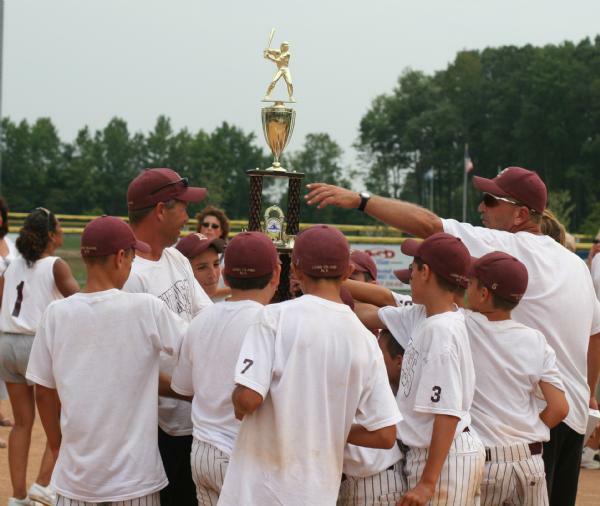 The Express train rolled into the Ed Rall Memorial Tournament, having won 3 consecutive tournaments at Baseball Heaven, and with the desire to add another one. The team was ready, as they outscored the competition 53-0 in the 1st four games, advancing to the finals against the NY Outlaws, and then defeating the Outlaws in the championship game with an inspiring come from behind 6-5 victory. During the course of these 4 games, pitching was outstanding, as well as the defense. The infield was awesome, led by Dylan and Darien. When the middle infield is solid, everything else seems to click. Matt, Nick, Chris, and CJ were outstanding manning the corners, and shots to the outfield were smothered by Ryan, Dan H. and Dan D. Kevin caught the majority of innings, and all the practice of taking bounced pitches off his chest are paying off. After winning the 1st 4 games, the venue changed from the CYA complex over to the SYAG complex. The team stopped by the “Club” to get rejuvenated with a quick head dunk in the pool, some Frisbee football, and a bite to eat. After a little break, it was off to the field, and back to business. The team had not given up a run in the tournament, but that would change quickly, as the Outlaws have a very good team. A quick single and double put the scoreless streak in jeopardy. A ground out to short turned into 2 runs after the putout, and quickly the Express were down 2-0. Dan D. was pitching a great game, limiting the Outlaws to just 4 hits for the next 5 1/3 innings on a very hot and humid afternoon, but the Express bats were still a bit quiet. With the score still 2-0 in the bottom of the 5th, Nick led off and reached on an error. Ryan followed with a single, having found a new friend in Kevin’s bat, and both advanced on a wild pitch. Kevin lofted a fly to right, and Nick was tagged out at home trying to score on the sac fly. Ryan moved up to 3rd and scored the teams 1st run, racing home on a passed ball. Darien reached on a walk, one of 4 for him in the game, and Dan H. followed with a hard line drive to center. The outfield turf was extremely dry and fast, and the ball got by the centerfielder. raced around from 1st to tie the game, and Dan tried to catch him, scoring the go ahead run, as the ball just seemed to roll forever. Chris then came up and smoked a ball down the left field line, giving himself a stand-up triple but the Express could not find a way to bring him home. With a 3 run inning, the Express went back on defense, up 3-2. Led by Dylan, who had 5 assists and one putout, the team tried to clamp down on a strong Outlaw team. After a quick out, the Outlaws tried to mount a rally in the top of the 6th. A single to right got the tying run on, and then a hot grounder to Matt’s left at 2nd base. Matt got over, and knocked it down. As the ball bounced away from Matt and rolled towards 1st, he was able to get after it and underhand it to 1st as he fell forward for the out. A huge play, 2 outs, and a man on second. The next batter was handled when Nick made a strong throw from 3rd to 1st to end the inning. As we moved to the bottom of the 6th with a one run lead, the team knew it needed more runs. Dylan reached on an error, and Matt laced a single. Nick hit the next pitch to 3rd. Dylan stopped in his tracks, not trying to advance to 3rd, and the 3rd baseman threw to 1st, thus allowing both runners to advance into scoring position. Ryan came up, and after having a slow start, had been 3-4 in his last at bats. Ryan hit a double to right, scoring both runners, and making the score 5-2. Kevin then hit the next pitch right over the 3rd base bag for an RBI single, and a 6-2 lead. Danny took the mound to try and close out the Outlaws, but the same hard outfield turf that helped us, gave the Outlaws a chance. With another runner on, the next batter hit a fly ball towards right center, and once it hit the hard ground, it took off for a 2-run homer. Danny was in his 7th inning pitching, and had only given up 8 hits. He had pitched a great game to that point, and it was time to bring in Dylan for the final 2 outs. The next batter immediately singled, putting the tying run on 1st. The next batter pulled a ball down the 3rd base line, but new addition to the team Nick moved quickly to the bag, and instinctively threw a strike to 2nd to get the force. A huge defensive play in the inning. 2 outs. With a runner on 1st, and CJ catching, he knew he needed to block any balls in the dirt to prevent the runner at 1st from advancing into scoring position. And that’s what he tried to do when he smothered a 2-2 pitch in the dirt with he forearm. CJ was in a lot of pain as the ball squirted away, but managed to get up to keep the runner from advancing 2 bases. He needed to be removed from the game, but rooted hard from the bench while icing his arm. Kevin came in to catch, and after going 3-2 on the batter, Dylan struck out the final batter with the tying run on 2nd, and the Express had there 4th title in a row. A fantastic weekend, both for the boys and their families. A special shout out to all those that came down during the weekend to see EXPRESS BASEBALL. We know you all are busy, and it means a lot to see you down there rooting the boys on. That’s how we roll. And there is still plenty left in the can. The Long Island Express continued their hot streak in tournaments at Baseball Heaven with another strong outing, resulting in a 6-0 record, and their 3rd Tournament Championship in a row. The team opened up against the Middle Country Mustangs on Friday night and got right to business, scoring 6 runs in the 1st two innings. Highlights included in 3 hits apiece by Dan H, Dan D, and Johnny, as well as a pair by Chris and Kevin. and Dan H. each scored 3 runs, and Kevin pitched 4 strong innings, with Ryan closing out the 5th for the 12-2 win. Sunday brought on a doubleheader, and the boys were ready. Again they jumped out to an early lead, this time against St. Killians, scoring 6 runs in the top of the 1st. A leadoff walk for Darien, then 5 consecutive hits by Dan D(2B,), Johnny, Matt, Dylan, then capped off with a sweet home run over the left field wall by CJ, and the Express were on their way. Ryan pitched a complete game 4-hitter, and Johnny, Matt, and Dan D. were all 2 for 3. The 2nd game of the doubleheader brought on a stout team in the Brooklyn Bonnies. scored 2 runs in the 2nd, but the Express hung around. Matt lead off the bottom of the 3rd with a single, stole 2nd, and scored on a sacrifice bunt by Dylan. In the top of the 5th, a runner on 3rd with 2 outs, the number three hitter for the Bonnies hit what appeared to be a base hit down the right field line. But Matt raced to the line, spun completely around towards center, and threw a strike to 1st to get the 3rd out. In the bottom of the 5th, down 2-1, Dan D stroked a double, and scored on a fielder’s choice by Matt, tying the game up. Johnny and Danny D. pitched a combined 1 hitter through 6 innings, and Dylan came on in the extra inning 7th to shut down the Bonnies. In the top of the 7th, Dan H made a sliding catch of a line drive, and the secret weapon Christian was on his game, sprinting to back up from left in case the ball got by. changed pitchers in the bottom of the 7th, and Dan D hit the 1st pitch he saw to left center for a single. Johnny hit a screaming ground ball that got past the shortstop, which enabled Dan to get to 3rd with no one out. Dan had a good lead off 3rd, and the pitchers pick off throw went into left field, and the Express had secured their 3rd win of the tourney with a come from behind extra inning 3-2 win. Game four came Monday against the Long Island Thunder, and the Express seemed to be a little sluggish. Chris did a great job on the mound, as he held the Thunder to one run on one hit through 3 innings, and the bats supplied him with a 2-1 lead. Going into the bottom of the 4th, the Express still needed to build a lead. After getting the 1st two outs in the inning, CJ and Kevin worked out walks. Ryan and Darien came through with 2 out hits, another walk for Dan H, and hits by Dan D and Johnny gave the Express an 8-1 lead. Ryan pitched the final 3 1/2 innings, and the game ended 8-1. Heading into the semi-finals, the Express had secured the top seed with a 4-0 record. Next up for the Express was the X-Factor. The kids came out strong, scoring 4 in the first inning. Dylan was pitching, and battled through a rough 2nd inning, when the X-Factors tied the game. But that would be all Dylan would give up, as he only gave up 2 more hits for the rest of the game. The boys broke it open in the 5th, scoring 8 runs and batting around. Kevin had 2 hits in one inning, , Dan H, Johnny, Chris had hits, and CJ and Ryan stood strong after getting hit by pitches. Dylan pitched a complete game to get us into the finals. The championship was played against the Connetquot Chiefs, a strong team of well-coached athletes. The Express and the Chiefs have met many times over the years, and each game proves to be classic. This game would be no different. The Express scored 3 quick runs in the top of the 1st, but Conyo came back with 2 in the bottom half. Conyo grabbed another run in the bottom of the 3rd to tie the game. Chris was leading off the top of the 4th, and fell behind 0-2. The next pitch was up in the zone, and Chris drove it over the left center field fence for a home run to make the score 4-3. A hit by Dylan, and consecutive walks by CJ and Kevin loaded the bases. After a pitching change, the game took a turn towards the Express. Dylan broke for home on the pitch, and Ryan laid down a perfect suicide squeeze bunt. As Dylan slid across the plate, the throw to 1st went wide, another run scored, and the Express had a 6-3 lead. A couple more hits by Dan H and John, sandwiched around a walk to Dan D, and the Express left the inning with a 10-3 lead. John had pitched 4 strong innings, giving up only 4 hits to a great hitting Conyo team. Dan D came in to pitch the final few innings, and only allowed 2 more runs to score. Kevin had a nice catch and throw ‘em out at 2nd double play, and the Express closed out the Championship game with a 10-6 victory. 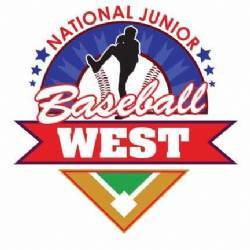 Some highlights included Johnny batting .667(12-18, 2B,3B) and 6 innings pitched against and Conyo, Chris .615(7-13, 1HR), Dan H. .438(7-16, 4 2B, 9R), Darien (8R, .545 OBP), CJ’s blast to left, Matt’s tying run against Brooklyn and throw to 1st to end the inning, Kevin’s 2 hits in one inning, Dan D. batting .529(9-17, 3 2B) and 6 innings pitched against Brooklyn and Conyo, Dylan pitching a complete game in the semi’s, and Ryan pitching 10 innings and his suicide squeeze bunt in the finals. And let’s not forget about our biggest supporter Christian, always there rooting us on, and making the right plays when called upon. Together, this team has accomplished much. John Wooden once said, “It is amazing what can get accomplished when one doesn’t care who gets the credit.” The Long Island Express has proven to be a complete team. 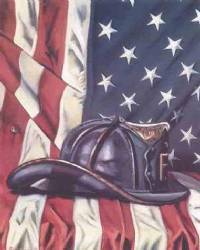 Pulling for one another during the good times, standing together during the rough times. The Long Island Express parents should be proud of the way their children conduct themselves on and off the field, and it is a great honor to be a part of such a special group of kids. Congratulations Express, keep on working hard. 1-Darien-making a diving catch over his head, falling over a sliding Hetzel, and getting up to throw to 2nd for the double play. 2-Dan H-a running, sliding catch against the Bonnies to take the wind out of their sails. 3-Dan D-hitting a line drive to left, off the yellow fence protector, one inch from a home run. 4-Johnny-peppering the rightcenter field fence with line drive after line drive. 5-Chris-hitting an 0-2 pitch over the left center field wall in the top of the 4th of a 3-3 game. 6-Matt-sprinting to the right field line, spinning towards the outfield and throwing to 1st, to get out a disbelieving batter. 7-Dylan-getting an awesome jump from 3rd, sprinting towards the plate as the pitch is in mid-flight. 8-CJ-rapping a homer just inside the right field foul pole, forever known as the "Schildt" pole. 9-Kevin-shaking off the previous play, catching a fly ball, and throwing out the baserunner at 2nd. 10-Ryan-laying down a perfect suicide squeeze bunt. 11-Christian-Subbing for Ryan, Christian instinctively sprinting towards center to back up the diving Danny Hetzel. The L.I. Express entered this tournament feeling good after a successful spring season, and their 1st tournament win as a club earlier in the year at the Spring Bash, Baseball Heaven 2006. Our initial game was against the Pelham Highlanders, and both teams came out swinging. After jumping out to a quick 4 run lead in the top of the 1st, the Express gave up 2 in the bottom half. As the away team, the Express had what appeared to be a comfortable 8-3 lead heading into the bottom of the 3rd. Then Pelham scored 7 runs on some timely hitting, and untimely defense. But the Express, solid as a team this year mentally, came back and scored 7 runs of their own, and the game was called because of time, with a 15-12 win in our pocket. Highlights included Chris (3 for 3), Dan H., Matt and Johnny (2 for 3), and and Dan D with 3 runs scored. Final score 15-12, Express. The 2nd game of the day was to be against a strong Connetquot Chief team. Johnny lead us off with 3 shut out innings, followed by Danny D’s great effort of 3 strong innings. Conyo scored a run in the top of the 6th, and the game went to the bottom half with the Express trailing 1-0. With one out, Dan H. laced a double to right center, and scored on Johnny’s single through the left side of the infield. The game went into extra innings with Dylan pitching a solid 7th, and the game ended in a tie. Besides stellar pitching by Johnny, Danny D. and Dylan, the highlight of the game was defense, and no play was better than Ryan’s diving catch of a line drive over his head in left. The boys brought their “A” game in the field, and it showed. 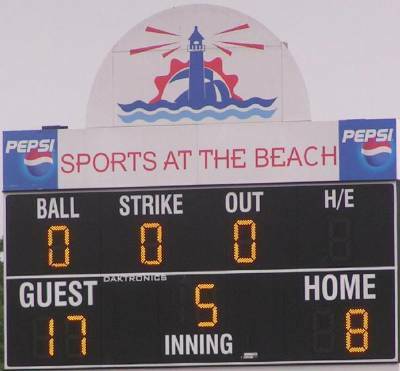 The following day, the boys came out a little sluggish, and were down 3-0 to the Long Island Lightning in the bottom of the 5th, without any hits. Chris led off with a booming single to the wall in right center, and that seemed to wake up the Express. With the score tied at 3, bases loaded, and the infield in, Ryan took a 0-2 change up and lifted it over the 2nd baseman’s head for a 2-run single to take the lead. Consecutive singles by and Dan H lead to a bases loaded ground rule double over the left field wall for Johnny, and game was well in hand. Highlights included 3 strong innings pitched for both Chris and Dylan, and timely hitting in an 8 run 5th inning. Final score-8-3, Express. Game 4 came against the SYAG Braves, with a trip to the playoffs on the line. Wasting no time, the Express scored 8 runs in the bottom of the 1st to take the pressure off, and Matt pitched a strong game. With the Express leading 11-2 in the bottom of the 5, they only needed one more run to end the game with the mercy rule. Chris took care of that with a 2-run, walk off homer over the left field wall, and the celebration at home plate was on. The semi-finals, against the CONYO Chiefs, would be a thriller. Dan H. continued his hot hitting with a double in the gap, and scored on Chris’s single in the of the first. Johnny pitched tough for 3 innings, allowing only 1 run, and the Express took a 4-1 lead into the bottom of the 4th. CONYO loaded the bases, and on a seeing eye hit up the middle that took a crazy hop Dylan’s mitt, rolled to the wall, and plated all 3 runners to tie the game. Danny D came in to get the final out of the inning, but the boys seemed a little dazed when they came off the field. Ryan led of the next inning and laced a double to right center to get things started. ripped a single up the middle to score Ryan, stole 2nd, and scored on Danny H’s double. Johnny knocked Dan in from 2nd, and the Express moved onto the finals with a well-deserved 7-4 victory. In the finals, the Express came up against the undefeated Chesire Reds (5-0). The first inning proved again to be good to the Express, as they scored 3 quick runs. With Dylan pitching, the Reds scored 2 in the bottom of the 1st, but that would be all they got against Dylan, as he proceed to shut down the Reds for the next 2 innings. Kevin provided some timely defense, ending the 2nd inning by throwing out a would be base stealer at 2nd base. Dan H., Chris, Johnny, and Dan D. all were 2 for 3, but the highlight was CJ bouncing one over the left field wall for a ground rule double. Dan D. pitched the final 3 innings, giving up only single runs in both the 5th and 6th, and the Express were crowned champions for the 2nd time this year, winning the game 8-4. The boys proved to be very focused during this tournament, playing well from ahead as well as behind. As a team, the Express batted .421, lead by Dan H (.611, 4 2B), Johnny (.529, 2 2B), and Chris (.526, 1HR). The pitching was outstanding, lead by Dylan (8 inn), Johnny (7 inn), Danny D. (8 inn), and Matt (5 inn). Kevin was an iron man behind the plate, and Ryan, , and CJ turned in great defensive plays at key times. A big thanks to the families for committing so much time to the Long Island Express, and to the boys, for their commitment to excellence. 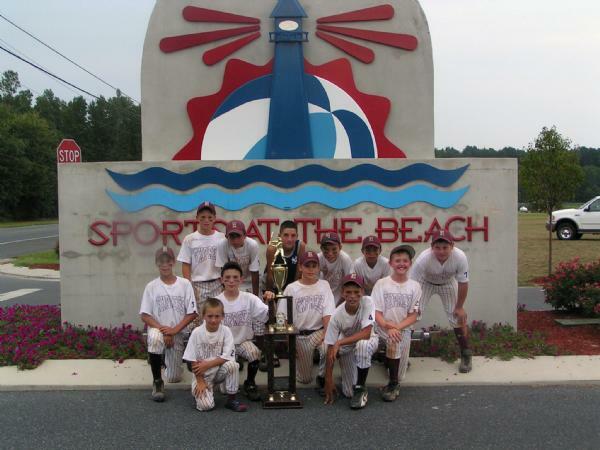 The Long Island Express 11u team began its 2006 season with a rousing start, sweeping all 5 games at the Spring Bash Tournament held at Baseball Heaven, on March 31st-April 2nd. It was a true team effort from the boys, who undoubtedly became a bit tired with indoor practice all winter, but then realized what hard work can bring, a tournament championship. The weather was perfect for an early spring Friday night, and the team responded to its 1st challenge against the Long Island Thunder by scoring 3 runs in the 1st inning of their 1st game of the year. The pitching was flawless, with Kevin and Chris hurling a 4 inning shutout, and the offense was lead by Dylan, Ryan, and Matt, who all went 2 for 3. A final score of 10-0 got us off the field early, and saved our pitching for later in the tourney. Game 2 brought an old foe to town, the Connecticut Dawgs, a team we met up with in the 2005 Triple Crown Memorial Day Tournament. We beat them in the round robin, but lost in the finals last year. The boys felt they had some unfinished business, and they were up to the challenge. Lead by 2 innings apiece of outstanding pitching, Danny D, Dylan, and Johnny combined for a 6 inning 3 hitter. The offense started off slow, but rallied in the 4th and 5th innings for a total of 5 runs. Johnny and Matt had 2 hits apiece, and continued his quest to be on base every time, having reached safely since the beginning of the tourney, 6 straight. A final score of 6-1 got us off to a 2-0 start. Game 3 came next, against the North Shore Baseball, from a team we knew nothing about. Runs were tough to come by early, but Kevin was pitching a gem, and our luck was about to change. The bottom of the 4th proved to be the time, as the team batted around, scoring 5 runs. That would be all we needed, as Kevin closed it out with a complete game 2-hitter. On to Sunday, the semi-finals, and the New York Outlaws. Pitching was going to be a premium for both sides, and runs would be scarce. Dylan continued his torrid hitting in the 1st, lacing a single to left center, stealing 2nd, and scoring on a ground out. Scoring the 1st run was huge, giving the boys confidence that they could hit anyone. The bottom of the 4th proved once again to be hold good fortune for the Express. 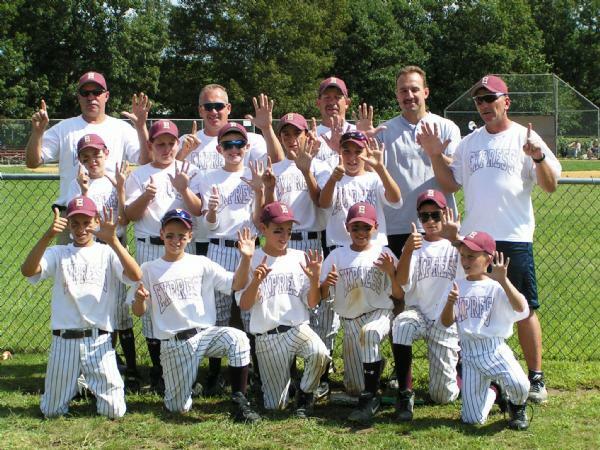 The team sent 8 boys to the plate, and scored 3 more runs, for a total of 5 in the game. Danny D went the whole way pitching a flawless 2 hit shutout, Dylan was 3 for 3. The finals, again against the Connecticut Dawgs. The boys had worked hard all winter, and now it was time to see if they were up to it. The Dawgs scored 3 in the top of the 1st. Unfazed, Danny H and Dylan lined base hits to start the bottom of the 1st, and then scored on outs later in the inning. A great answer to 3 runs in the top, and the boys were on their way. Johnny battled on the mound, and the Express broke the game open in the bottom of the 3rd, scoring 8 runs, and all but ending the Dawgs hopes of taking 2 tournament titles from the Express in 2 tries. Chris, Matt, Kevin, and Dan H all had 2 hits apiece. Dan H, Matt, and Kevin all turned in stellar defensive plays in the field, helping out the pitching at a crucial time in the game. Johnny got tougher as the game wore on, and pitched a complete game for the winner. A great tournament for the boys. Dylan was on fire with his new found friend, Ryan’s bat. Going 8 for 11, the pitching staff came up big. The coaches could see it in the boy’s faces at times this winter, why are we doing this over and over again? But when they tossed there mitts in the air at the end of the game, it was all worth it. The coaches harping on hitting the cutoff man, getting a good lead, and of course, “HANDS”. Lets not forget our Captain CJ who is on the DL and supported the team throughout the tournament, CJ is scheduled to return real soon. Thanks to Jason, for being there throughout the tournament and stepping up when we needed him. Three cheers for the Express. You boys made us proud.